I bought some samples of CC Cream. This time I try the high-end Korean brand such as Hera, Sum:37, and The history of whoo. This is the first time I try these brand. Usually I will go with middle-end Korean brand like Etude House, Tony Moly, Holika Holika, etc. Texture: Quite runny if I compare it with BB Cream. The texture is more like lotion for me. The color is natural beige with a beautiful shimmery things inside the lotion. It provides medium coverage and give me an instant glow as soon as I apply it on my face. This CC Cream also smells good~ and quite strong too. 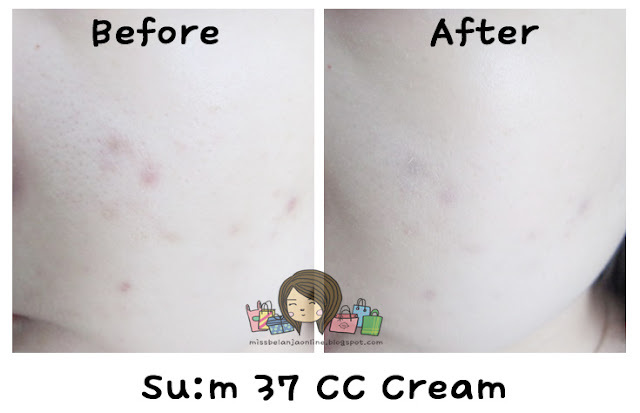 Usually CC cream doesn't provides much coverage *based on my friend's experience*. 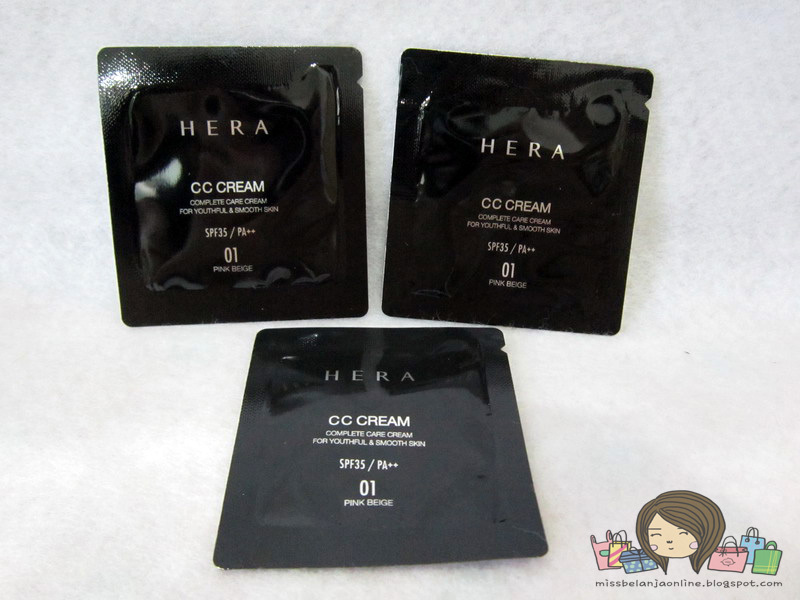 But, Hera CC cream is quite buildable and can cover redness quite well. Of course if you have acnes or blemishes you will need more concealer after you use this CC Cream. This CC cream slightly provides dewy finish but it isn't too much. As for the oil control, I can say it is so-so. My face gets oily after 3-3,5 hours. Overall about Hera CC Cream: Evens out skin tone, buildable coverage, give natural glow and slightly dewy finish. Texture: The texture is quite creamy and not to runny, it has white color when the first time I squeezed it from the sachet. 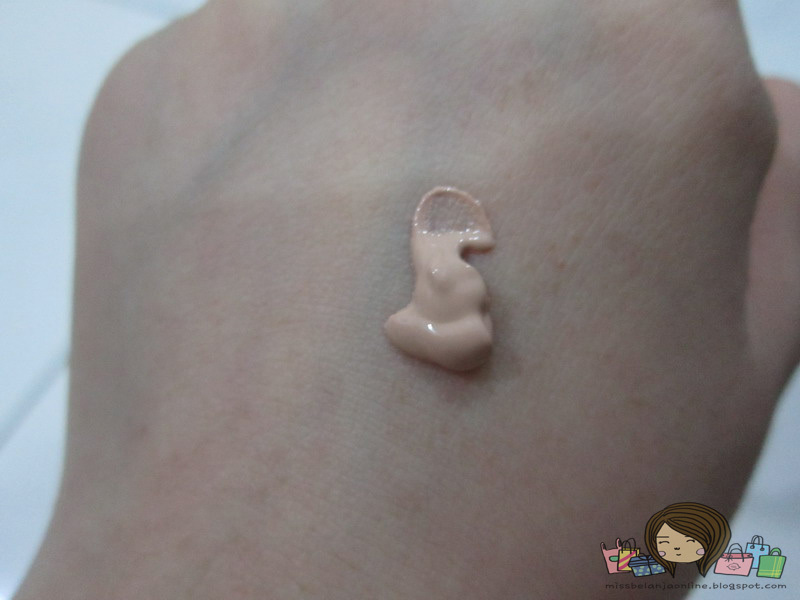 I have this kind of BB cream before, from Luview. After blends it with finger or sponge, the color change into natural beige. I really love the instant bright result from this CC Cream. It really makes my face brighter but still natural. This CC cream also provides matte / powdery finish, which I really love! It is suitable for oily skin like me. The oil control for this CC cream also makes me impressed. 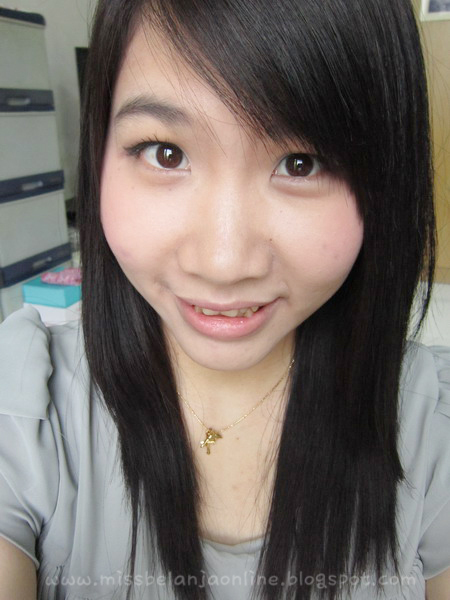 Usually, my face tends to get oily after 3,5-4 hours. But, when I used this CC cream, my face still looks matter after 4 hours. 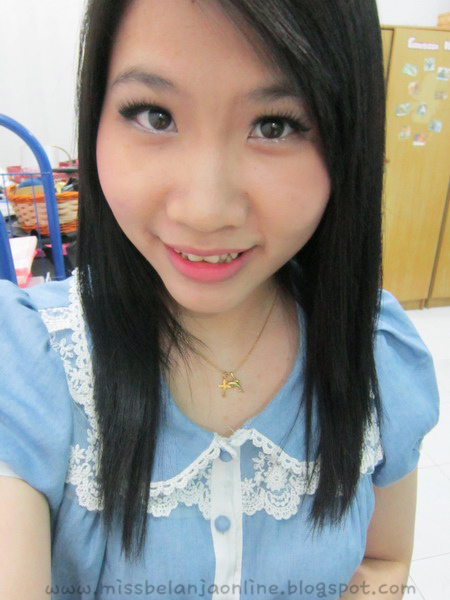 It is quite rare~ even my friends asked me, why I look different. They already recognized my habits to use oil control paper during lunch breaks, but the day when I used Whoo CC cream, I don't used my oil control paper like usual hahahaha. The down point from this CC cream for me is the coverage. It is really sheer and not cover my acne scars at all. Aigoo~ if this CC cream has at least medium coverage, I will not hesitate to called this my HG CC cream. Texture: the texture is between the creamy and runny texture, maybe it can be called lotion. It has white color like the history of whoo cc cream, after blends it well, the color will change to natural beige color. It has a nice instant bright and healthy glow result. I really love the finish result from this cc cream. The coverage is medium like Hera cc cream. I tried to smell the scent but can't smell anything hahahaha. 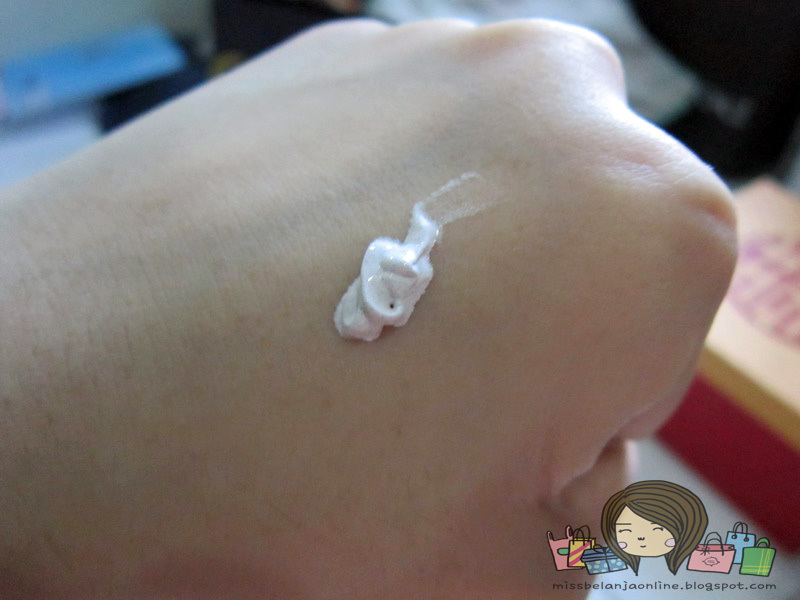 Well, there's slightly flowery scent from this cc cream, but it isn't really noticeable. Though I love the finish result so much, It doesn't goes well with the oil control. My face looks greasy and oily after 3 hours. Well,it is almost similar with Hera cc cream. I can't decide which one is my favourite or which one will I buy for the full size. You see, I love the medium coverage and flowery scents from Hera, Matte finish and great oil control from Whoo, then the instant bright effect from Sum:37. I hope there is 1 CC cream that can give me all that hahahaha. Well, If I have to pick, maybe I will go with The History of Whoo CC Cream as my favourite (well, you can always use concealer to cover the imperfection that CC cream can't cover, right? hehehe). 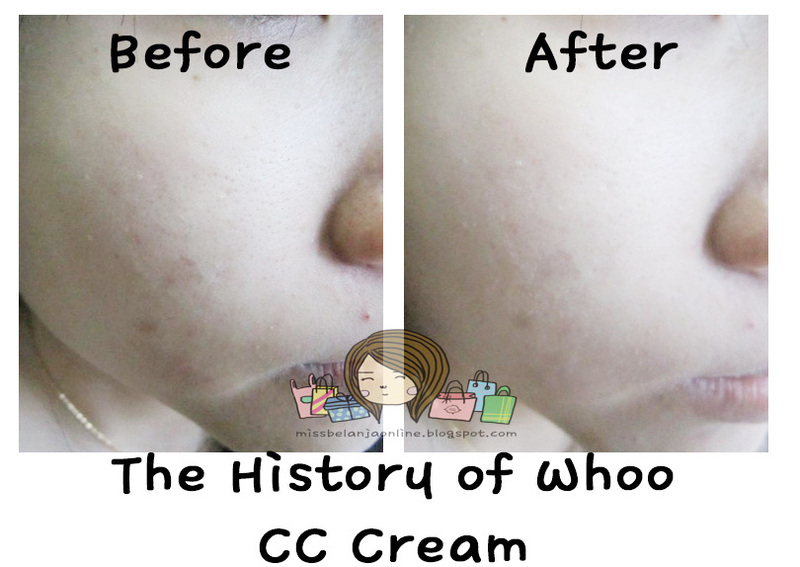 cc cream high brand yg uda ak coba si history of whoo Sha.. jadinya emang putih banget, hampir mirip sama etude yg silky..
betulll..harganya ga nguatin semua >_< mahal2 hahaha..
sha kamu pakai powder lg nggak stlh pk cc cream?